No matter the application or the industry, our diverse range of processes and highly trained employees allow us to offer our customers unparalleled value, customer service and delivery times. In other words, you can count on us to keep your equipment running. Some of the largest OEMs in the world trust us to make, repair or improve their parts. Our diverse and unique roster of processes allows us to provide unparalleled solutions to our customers. If you have a problem, we can find the solution. High Velocity Oxygen Fuel coatings are some of the highest quality coatings that exist today. 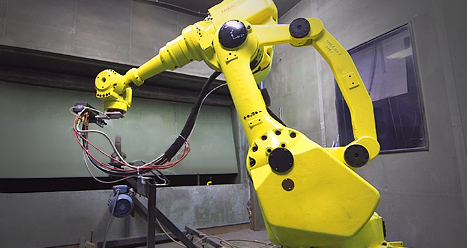 Our robotic application of these coatings results in tight deposit tolerance, efficiency and spray consistency. For one off components or high volume jobs our robotic HVOF coatings are the answer. We don’t find customers for our products and solutions, we find solutions and products for our customers.